After its remarkable successes with the ZX81 and Spectrum, it seemed that Sinclair Research could do no wrong. 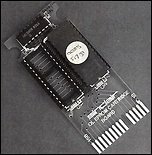 Its next computer, the Sinclair QL (or "Quantum Leap"), was promoted as a revolutionary breakthrough - the first 32-bit home computer, costing under £400. Great things were promised - reliable twin microdrives, multitasking, networking, a proper monitor, a huge 128KB of memory backed up by a Motorola 68008 processor. The optimistic mood was summed up by Sinclair's television adverts, showing a scarf-wearing Sir Clive leapfrogging over a line of competitors' inferior products. It was not to be, however. The early promise of the Sinclair QL was rapidly undone by the disastrous technical and production difficulties which the machine encountered in its first months on the market. As had happened on so many previous occasions, Sinclair's delivery systems and quality control were seriously deficient; frustrated owners waited months for their machines only to find, in many cases, that when they eventually arrived they did not work properly. Even those that did work initially came with an unexpected addition: a "dongle" (right), a small board hanging out of the rear of the machine, containing the ROM. Sinclair's rush to get the QL onto shop shelves meant that the ROM had not been finalised when the machine went on sale. As a result, it had to be mounted on an external board - hence the infamous dongle. Despite all the problems, the QL did manage to achieve sales of 100,000, though this was far less than Sinclair had hoped for given the machine's specifications. The ZX81 and Spectrum had, by comparison, sold millions. To some extent, this was a result of the way in which the machines were marketed. The ZX machines were unashamedly aimed at the home market and overwhelmingly used as games machines. The QL, on the other hand, was pitched very much at business users - the number of commercially available games produced for the machine was negligible. But Sinclair was unlucky in his timing. The release of the non-PC compatible QL happened to coincide with the rise of the Microsoft-Intel-IBM standard. At the same time, the cost of PC hardware (notably mass storage devices) fell to a point where the QL's price advantage was eroded. Within a couple of years, businesses had adopted a standard setup - IBM-compatible PCs running MS-DOS - and the market for a non-standard business computer like the QL simply vanished. After the 1986 takeover by Amstrad of Sinclair Research's computer business, the QL was quietly dropped. However, the QL's technology survived for a while in a number of different guises, notably as the ICL One Per Desk. [I] was eventually able to get a Sinclair QL and get some real programming done under a multitasking (albeit somewhat weird) system. On the Sinclair QL I continued to program in assembly (the QL BASIC (SuperBasic) was ok, but I wasn't interested), and I wrote various more-or-less useless programs (ranging from a FORTH compiler and an editor-assembler system of my own to Pac-Man to a MSDOS compatible floppy disk driver). The QL was a fun machine, but there weren't very many of them in Finland, and although I was generally happy to write my own programs (still am), it did teach me to buy hardware that actually is supported. In March 1991, Torvalds upgraded to a 386 PC, using the programming knowledge which he had gained on the QL to produce a cut-down version of the UNIX operating system which he nicknamed Linux. The rest, as they say, is history.